Ever since my enlightening conversation with money in 2012 ( feels like lifetimes have passed since writing about that! ), I have been having the most interesting insights and shifts. You know how you can read or hear about something 1000 or so times and then the next time it ‘suddenly’ clicks into place? Somewhere in 2011 sometime Nalini MacNab from Chalice of Wisdom told me about Inelia Benz’s ‘Reconnecting with the Spirit of Money Exercise’ . I listened to the audio and did the exercise, however, something in me was resisting things shifting so… I ‘forgot’ to do it and then forgot all about it… sound familiar? Then I had my enlightening conversation with money and soon after a friend shared a comment on Facebook about Inelia’s exercise. I popped on over to Inelia’s site again and actually read the written version of the exercise. The signature, you will find, is extremely similar to that of Mother Earth because they are one and the same. That I had not read that or registered that as a big aha before was amazing to me! Seems it took a while for me to allow this to emerge in conscious awareness. As I had been very aware that presence or absence of money has nothing to do with money itself but everything to do with the projections we have placed upon it and/or identified with, I started pondering how I could take this to another level. And so it dawned on me that it was time for the Divine Money Laundry Service. Nalini had been teaching me how to let the HeartSpace hold me and to surrender everything holding me back from embodying my Divinity to the Divine, to hand it over to the transformational cocoon. After that conversation with money I took out a few 50 euro bills and sprayed them with one of my Aura Soma sprays, to clear the energy of the projections infused in those bills. You could do this with a smudging stick or holy wood or whatever clearing method you prefer,too. Or create your own spray by adding some yummy essential oils to water and spray with that. Something magical happens when those bills smell delicious… and it is a lot of fun! It occurred to me that every time I do this, whether money is coming into my bank account or is handed to me in physical notes or coins, that I have another opportunity to clear that money of all the projections and once again reveal her essence of love and light. And that whenever I then send that cleared money into circulation, she is spreading love and light everywhere she goes. I simply intend the money in my account to be cleared by the Divine Money Laundry Service and to be infused with the yummy spray of my choice, just like I would spray the bills in my presence. 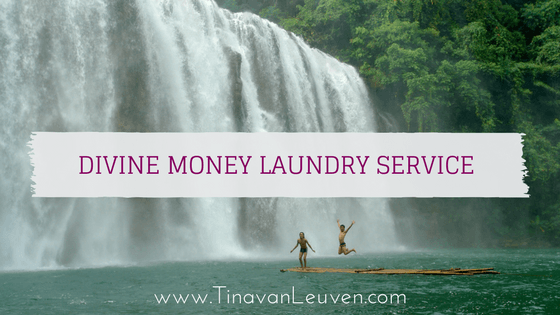 So there you have it, the Divine Money Laundry Service! It is free, anyone can use it and it is available 24/7. Can you imagine how your experience with money might transform when you look at it this way? and allowing the Divine to transform all of that so that the essence of money remains, to be circulated consciously. I’d love to hear about your experiences and what this may have stirred within you! Previous Post 3 Simple Ways To Bring More Joy and Abundance Into Your Business | #2 Prioritise And Create Space Next Post How Do You Stay Joyful When You’re Feeling Worried and Overwhelmed?